Tamryn Joseph at her desk in the office where she works as a junior software quality assurance analyst in Cape Town, South Africa. Tamryn Joseph of South Africa says the Community College Initiative (CCI) Program changed her life by giving her the opportunity to have a successful future. 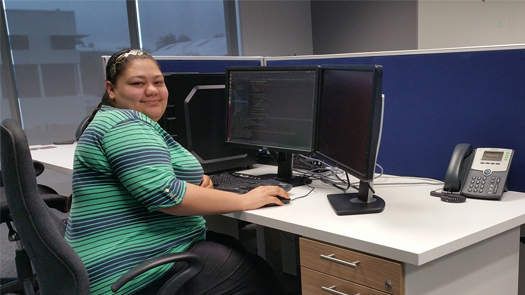 Now employed as a junior software quality assurance analyst at Dynamic Visual Technologies in Cape Town, Tamryn is well on her way to achieving her dream of becoming a software developer. Tamryn’s dream to enter the information technology (IT) field began early in her life. “Since I first interacted with technology, I knew I wanted to follow a career in it. I realized at an early age that in today’s world, there is nothing that hasn’t interacted with some form of IT, whether it’s a cellphone application, the timing of traffic lights, or even the equipment used to make the clothes we wear,” she says. “I applied for the CCI program for one reason: it is an amazing opportunity. Where I come from, chances like this don’t come along, for anyone. The CCI program is a great initiative that brings hope to people like me. I come from a place where the highlight of your day is being able to live to see the next day, where the things that children look forward to are the streets. The day I was told I was a CCI candidate, I cried because I knew that this would not only help me achieve my dream, but would also help me show the children of my community that there is hope for the future. All you need to do is try. I want to show everyone in South Africa that there is no reason at all that they can’t have the same opportunity as me. All they have to do is fight for their dream,” she says. Tamryn says her CCI experience is helping her to encourage the youth in her community in South Africa, to grab hold of their future no matter what. At Fox Valley, she volunteered at the local animal shelter, helped clean up a nature reserve, and at a rehabilitative care facility for veterans. In South Africa, she is helping people gain knowledge and access to opportunities they didn’t know they had by training them in the use of computers, helping them to find scholarships, preparing them for job interviews, and helping them to locate good volunteer opportunities. Much more lies ahead. Tamryn says she looks forward to becoming a senior software developer, developing web applications, mobile phone apps, and many other applications for different aspects of daily life. “I want to unite the world in a positive way with technology, and develop programs and applications that will bring people together,” she says.